It has been said that guitar virtuoso Denis Chang’s fingers “fly faster than his shadow”. Called the “Godfather of the Montréal gypsy jazz scene”, Denis is equally at ease with bebop and other jazz styles but it is when performing in the manouche style that he truly finds his passion. Horizon Stage is excited to present the Denis Chang Manouche Quartet, as a part of its 30th anniversary season, on Thursday, February 7th at 7:30 p.m.
Denis Chang’s family origins are Taiwanese but he grew up in Montreal and spent his formative years alongside some of the greatest manouche jazz guitarists, including Fapy Lafertin, Ritary Gaguenetti, Paulus Schäfer, Rindo Winterstein and Emmanuel Kassimo. As a young performer, Denis quickly developed his own style, influenced mostly by the music of the legendary Romani jazz guitarist and composer, Django Reinhardt, with some Bach, Chopin, George Benson, and Michael Jackson thrown in. Also an up-and-coming composer, he has been including a smattering of his own compositions in his concert play-lists since 2012. In 2008, Denis had the honour of being invited to perform with the legendary Les Paul at the Iridium in New York. Other highlights of his career include performing at the 2009 Montreal International Jazz Festival and winning an Entrée and Scène Award from Loto-Quebec. A highly sought-after guitar teacher and master-class instructor, practically every performing gypsy jazz musician in Quebec has benefited from Denis’ teaching. He has attracted private students from as far as California, Vermont, the UK and South Africa, and his manouche guitar instructional DVDs have been very successful. Denis’ student list includes the legendary guitarist of the Shadows, Hank Marvin, and guitar virtuoso Adrian Vandenberg of Whistesnake fame. While in Spruce Grove he will teach a Django Reinhardt Style Guitar Master Class at Horizon Stage on Wednesday, February 6th at 7 p.m. Priced at only $25, master class participants will also receive a free ticket to Denis’ concert on Thursday. Anyone interested in participating in the master class should call 780-962-8995. 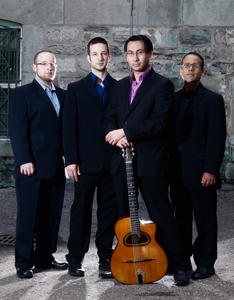 The Denis Chang Manouche Quartet are touring Alberta for their first time in February 2013. See them Up Close and Personal at Horizon Stage in Spruce Grove on Thursday, February 7th. Tickets are $30 for adults, $25 for students and seniors, and $5 for high school students through the eyeGO program. Curtain is at 7:30 p.m. Tickets may be purchased at the City Hall Ticket Centre (315 Jespersen Ave), by phone at 780-962-8995, or online at www.ticketmaster.ca. Come, see Denis Chang’s amazing fingers for yourself, and feel the heat of his gypsy jazz guitar!